Round 1. Ch5, join to form ring. Round 2. Ch2 (forms first DC), DC11, join with SS into first space. Round 3. Ch2, DC2 into same space, [miss a space, DC3] into next space, repeat four times, join with SS into top of first DC of round. Round 4. Ch2, DC into space between DC's, DC into top of next DC, DC into next space between DC's, DC into top of DC, [Ch1, DC into top of next DC, DC into space between DC's, DC into top of next DC, DC into next space between DC's, DC into top of DC], repeat four times more, Ch1, join with SS to top of first DC. Round 5. SS along to top of second DC, Ch2, DC into top of next two DC's, [SS along to top of second DC in next group, Ch2, DC into top of next two DC's] repeat four times more, SS along to first SS of round. Tie off yarn. Round 6. Join on green yarn to top of first petal. Ch6, DC into space between petals, Ch4, SC into top of next petal, [Ch4, DC into space between petals, Ch4, SC into top of next petal], repeat three times more, Ch4, DC into space between petals, Ch4, SS into first chain of the round. Round 7. Ch4, [DC5 into top of DC of previous round, Ch2, DC into SC of previous round, Ch2], repeat five times more. Join with ss to second chain at start of round. Round 8. Join blue yarn to space after DC5 group. [Ch2, DC then DC3,Ch1,DC3 into top of previous round DC,DC2 into next space, DC into each space between DC's of DC5 group of previous round]. [DC2 then DC3,Ch1,DC3 into top of previous round DC,DC2 into next space, DC into each space between DC's of DC5 group of previous round]Repeat 4 times more. Join with SS and tie off. Edited to add that DC is Treble in UK terminology. This is a very pretty motif. I'm from the US, is the pattern in UK terminology? These are very pretty. 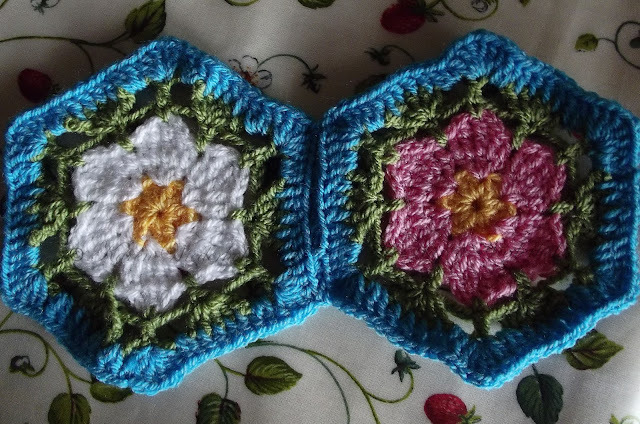 They remind me of the African flower hexagon. I seem to write in US terminology :-) I write how I was taught to crochet and then years later discovered I used US terminolgy. 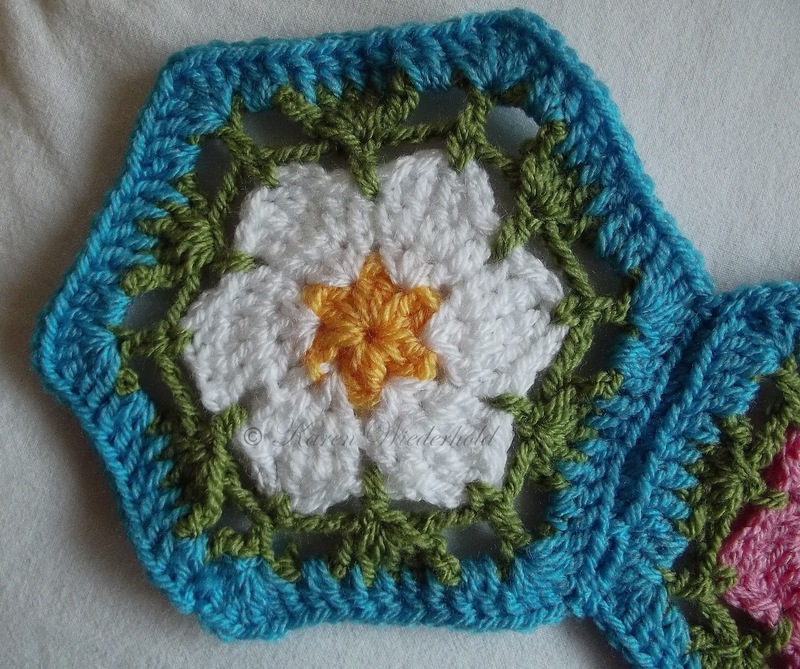 I grew up in South Africa and was taught crochet by my Scottish Mum so thought it was the same the world over. DC in UK will be Treble. very nice! thank you for the directions. Beautiful hexagon!!! Thanks for sharing. I will give it a try. I love motifs, and I am always looking for new ideas. This is lovely.